Hitchcock is too broad a title for this film. Granted, it’s about “the master of suspense,” Alfred Hitchcock, who’s regarded as one of the greatest filmmakers of all time, but it’s about such a small portion of his life that a more specific title was in order. And of that “small portion,” even though it may have been the most significant and famous of Hitchcock’s career, I can’t help but think there were more interesting ways to tell it and other aspects of his life that could have been worked in to give the overall story a greater depth and purpose. The film is based on Stephen Rebello’s book Alfred Hitchcock and the Making of Psycho (now there’s a title), and while I appreciate that it’s focused, anyone who’s even remotely aware of Hitchcock or Psycho, or the moviemaking business in general, won’t find too many surprises here. It serves more as a reiteration of things we probably could have surmised for ourselves (or picked up along the way while watching other movies about Hollywood and making-of specials), while the central dramatic conflict is merely adequate. Most of it feels whipped up just so the film can deliver moments of nostalgia and pieces of trivia. Although, to be fair, it does make us smile a lot, even if it never goes beyond that. In 1959, following the success of North by Northwest, Hitchcock is searching for his next project. He has one more picture to direct under his current contract with Paramount Pictures and doesn’t want to make just any old movie; he wants to blow the audience out of the water. 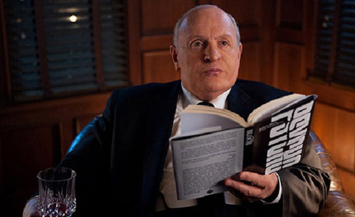 Hitchcock is played by Anthony Hopkins, who does what any actor should do when portraying a real-life individual: he lends him his own quirks and personality. Yes, it’s important to look the part and nail some of the broad strokes like how the person spoke and carried himself, which Hopkins could do standing on his head, but it’s even more crucial to make that person a character - someone who’s interesting, has presence and whom we care about in spite of our knowledge of their public persona. Playing an icon goes beyond mere imitation. Hopkins knows this and makes the portly Hitchcock a stubborn and fiery fellow who’s willing to put up a fight when Paramount executive Barney Balaban (Richard Portnow) refuses to finance his next movie because of its content and lack of commercial appeal. That movie, of course, is Psycho, based on Robert Bloch’s novel, which itself was loosely based on Wisconsin murderer Ed Gein. John J. McLaughlin’s screenplay for Hitchcock, in fact, makes Gein (Michael Wincott) one of the characters. He’s sort of an instigator and tormenter of Hitchcock throughout the production of Psycho and, at one point, Hitchcock imagines taking on the role of a killer himself and stabbing everyone who’s getting in his way of making the movie.